No coral in the Mediterranean they said, but then you see this everywhere…. but dammit – it is a ‘fake’ 🙁 called Myriapora truncata. Not to worry, it still looks interesting, especially if you have the benefit of a macro lens for your underwater camera. 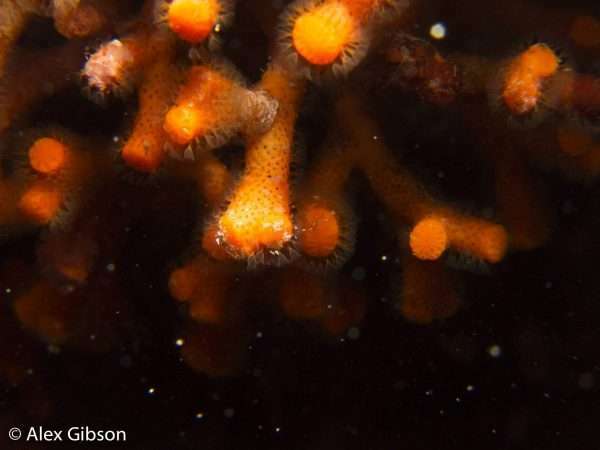 This Bryozoan resembles red coral, being of similar size and colour. However, it is more fragile – it even looks as if the ends of its branches have been snapped off – and out of the water, it loses its colour. The vibrant orangey-red seen in the photo here is only due to strobe lighting, but any diver can enjoy it by using a torch. This particular specimen was photographed at about 8 metres depth on the north(ish)-facing side of a large boulder at San Dimitri dive site on the island of Gozo, Malta. But it was everywhere if you looked for it. Alex Gibson is a UK-based diving instructor and keen underwater photographer. He can usually be found diving off the south coast of England, particularly in Devon and Dorset. He is Editor-in-Chief of Dived Up Publications.